Heel pain is surprisingly common, but not enough people here in Dallas take action about it. This can cause conditions to worsen and favorite activities to lose their luster. The sad part is that there is no reason to put up with the hurting, especially when it is so easy to come see us for care. Plantar fasciitis – This condition is marked by sharp heel pain that is usually experienced with the first steps of the day. 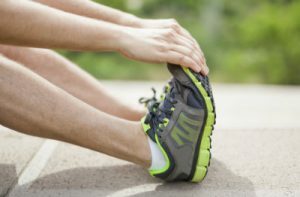 Achilles tendinitis – Pain in the back of the heel, especially following physical activities, could be a sign of an inflamed Achilles tendon. Sever’s disease – If an adolescent is experiencing heel pain, this condition caused by varying growth rates for the heel bone and Achilles tendon is often to blame. Other sources of pain in the heel area include stress fractures, bursitis, and strains and sprains. In many cases these injuries do not require surgical intervention, as conservative heel pain treatment is often quite successful at providing relief. Some of the nonsurgical options we employ are rest, ice, stretches, medication, and orthotic devices. The actual ones we choose for your case will depend on your condition, its severity, and your situation. Rest and time away from high-intensity activities is a must so your body can use natural healing processes to repair damaged tissues. It is important to know how much rest, what activities are safe, and when to go back to regular activity, and this is where our medical experts can help. Often a proper stretching program may be beneficial. Ice and medication both relieve pain and control inflammation in the injured heel as long as it is done safely. Keeping ice on an area for too long may lead to issues. In the same spirit, our prescriptions and recommendations for medication will keep you safe as your body recovers. Orthotic devices and shoe inserts may help treat an existing condition as well as prevent issues from arising in the first place. We may recommend an insert for cushioning and greater arch support. Sometimes, we prescribe orthotics customized to work with your unique feet and correct underlying biomechanical issues. For more information on professional heel pain treatment in the greater Dallas-Fort Worth community, give us a toll-free call at 972.566.7474 and we will be glad to assist. Our friendly staff can also help you schedule an appointment—or you can fill out our online form to request yours right now—at our Dallas or Plano, TX office.